1 pc. 3,73 EUR ea. from 3 pcs. 3,26 EUR ea. from 10 pcs. 2,85 EUR ea. from 20 pcs. 2,65 EUR ea. from 40 pcs. 2,47 EUR ea. Block magnets with two countersunk boreholes. They can be fastened with countersunk head-screws. 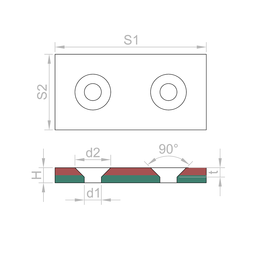 They are only 4 mm thick and therefore very discreet when used to hang up signs, tools, etc. Especially suitable for cabinetmaking, kitchen/booth/store construction, signage technology, etc. We also carry round Pot magnets with counterbore screw-on. 60 x 20 x 3 mm, as a counterpart to magnets, not a magnet! 5 pcs. 0,64 EUR ea. 1 pc. 5,10 EUR ea. 1 pc. 4,52 EUR ea. 1 pc. 2,51 EUR ea. 40 x 20 x 3 mm, as a counterpart to magnets, not a magnet! 5 pcs. 0,47 EUR ea. 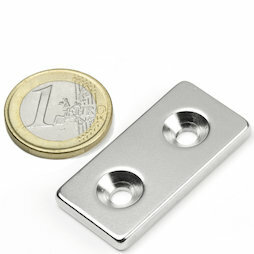 Neodymium magnets are very brittle and can break or chip when exposed to repeated blows. To protect the magnets it would be best to slightly countersink them into a material (e.g. into the wood of the furniture).